In Florida, resiliency is an evolving concept, but one that is critical for the future health and safety of our communities. With our low elevations, hurricane exposure, droughts and floods, resiliency planning is something that is starting to be integrated into emergency management. The idea that our communities can "bounce back" once impacted by a disaster, or the slower, but no less important, reality of climate change and rising seas. In a peninsular State, all 67 Florida counties will face more impacts from climate change and sea level rise, whether located directly on the coast or inland. Those impacts range from vulnerability and exposure to tidal inundation and flooding to unusually high rates of precipitation during the dry season. Regardless of the impacts, our communities, infrastructure and buildings should be designed considering the impacts from a changing planet. The USGBC supports resilient buildings that allow communities to be ready, not surprised. USGBC believes we must continuously look over the horizon to foreseeable and unforeseeable crises and see what plans are on the table, what preparations need to be made, and what assets are in place. And when these tragedies do occur, we need to deploy the resources and assistance to help communities recover smarter, greener and better. On June 20, 2015, the USGBC joined six major organizations to announce the Global Initiative on Urban Resilience (GIUR), an effort designed to spur building and infrastructure development, create new investment opportunities, and foster community action around the world. Partner organizations included the C40 Cities Climate Leadership Group, ICLEI International, the World Bank, the Eye on Earth Summit, the Johns Hopkins University School of Advanced International Studies Program on Energy, Resources and the Environment, and the Earth Council Alliance Brazil. The Initiative, launched during the plenary session of the ICLEI Global Town Hall, will work to create solutions by focusing on urban geographies, identifying the synergies between local governments, non-governmental organizations, financial institutions, and different business sectors. The National Leadership Speaker Series on Resiliency and National Security in the 21st Century serves as a forum for promoting a strategic vision for resiliency and features keynote speakers who are playing a leadership role in creating a safer, stronger and more sustainable future. 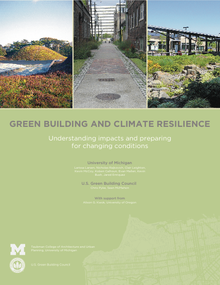 Green Building and Climate Resilience: Understanding Impacts and Preparing for Changing Conditions -- Summarizes the most recent research on the likely impacts of climate change at various scales: regional, neighborhood, and site or building. Sustainability Guidelines for Gulf Coast Reconstruction -- Read the guidelines developed to help redirect planning and rebuilding efforts, with the intent of enhancing environmental, social and economic outcomes. The New Orleans Principles: Celebrating the Rich History of New Orleans through Commitment to a Sustainable Future -- View the 10 principles for addressing sustainability in the post-Katrina reconstruction of New Orleans presented at a planning charrette. Forum: What does Resiliency mean to you?